Upstate Business Journal article featuring A Celebration of Us! As of June 2018, we have rebranded our embroidery services to Corporate Stitch to better reflect our focus on serving corporate customers with their custom business embroidery and other personalized branded products. We still offer t-shirt quilts and other consumer items in our online store for A Celebration of Us! 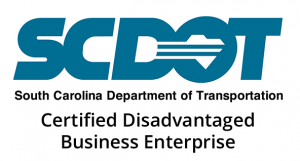 Based in Easley, South Carolina, Corporate Stitch is a Certified Disadvantaged Business Enterprise and Small Business Enterprise through the South Carolina Department of Transportation. We are also a Certified Minority and Woman-owned Business through the SC Division of Small and Minority Business Contracting and Certification. We provide embroidery services on a variety of products for orders of all sizes. Our commitment to quality is unparalleled, and we stand behind every stitch of our work. We were profiled on the Greenville Chamber of Commerce blog on April 10. 2018 as part of our participation in the Minority Business Accelerator Program. 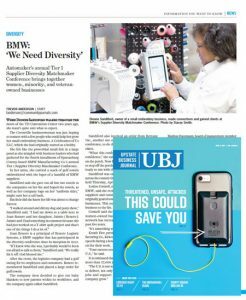 We were featured in the April 14, 2017 issue of The Upstate Business Journal for our participation in the 6th Annual BMW Supplier Diversity Matchmaker Conference in 2017. Click the image to the right for the digital copy of the full issue. BMW choose us as the Featured Company for the 2016 Conference. Below is the video shown at the event that year.